For my previous blog posts about my experience at Xarma Jatetxea, please check the following links! So what is it like being a Basque Stage here in one of the culinary capitols of the world? It’s unlike anything I could have imagined. With working under chefs that have worked for some of the most renowned chefs in Europe from Juan and Elena Arzak to Michel Bras, I could tell that I was in for a learning experience like no other. 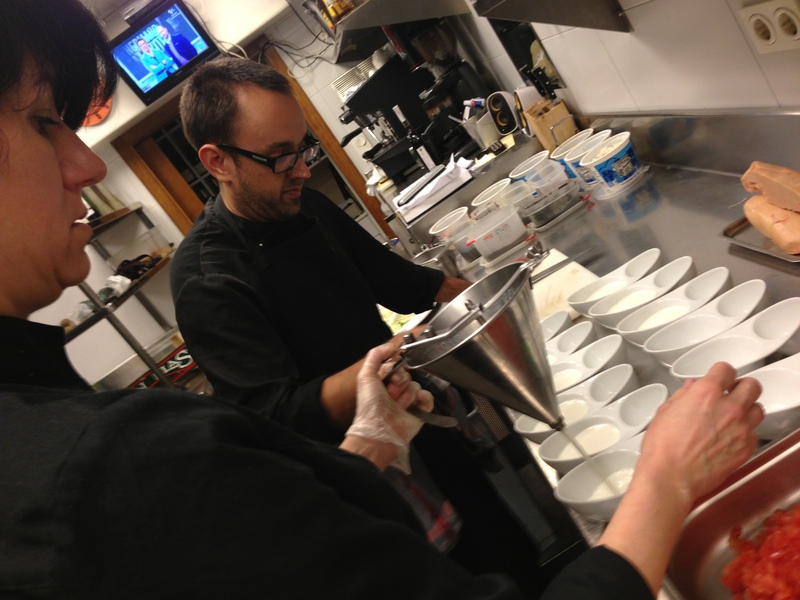 So this is a blog post about my time working under chef Xabier and Aizpea at Xarma Jatetxea. I was actually pretty surprised at what they had me doing on my first day on the job. I was expecting to do typical ‘intern’ tasks like picking parsley or peeling onions or something simple like that just to start out, but it was the opposite. Just on my first day, I made 3 types of spheres using the infamous methodology and chemicals that Ferran Adria of El Bulli Fame has introduced to the culinary world. 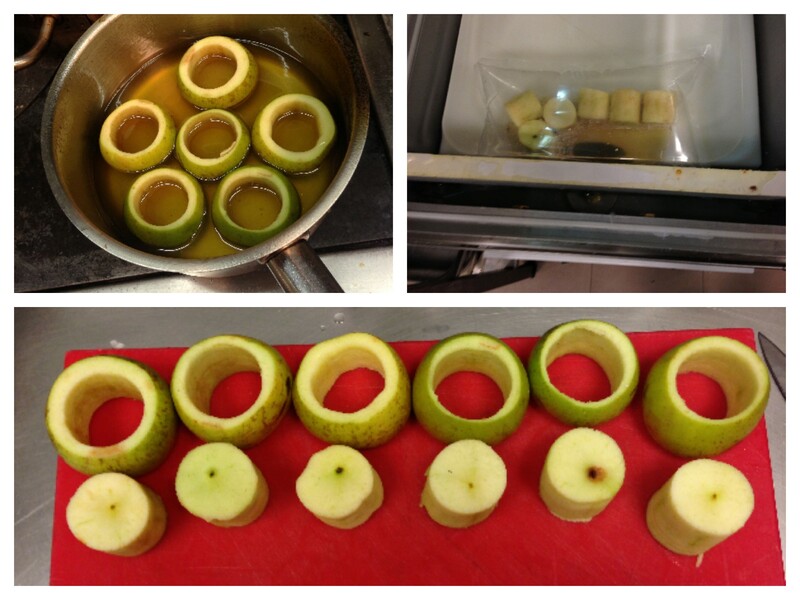 I had prepped out and made a very ingenious Tomato and Apple carpaccio. And when it came to service, I was appointed to plating a majority of their first courses and appetizers. “No tengas mideo!” Aizpea told me. “Don’t be afraid!” She responded back to me. And from then on, I tried to my hands in every single thing I could. I found myself doing more and more and getting a whole lot of hands on experience as the days came by. By the end of my first week, I had cleaned a case of beef cheeks, seared of the cheeks along with some oxtail, and braised them until they reached ultimate tenderness. I had cleaned and prepped up over 2 dozen squabs. And I have made basically all of the sauces that we use for all of the menus. By the end of the second week, I was appointed to prepping out and being in charge of two of the tasting menus that they offered and also was took control of all things pastry. I, for one, never thought myself of ever wanting to be a pastry chef as it is a whole different world, but I was quite excited to actually learn this side of the culinary world. It amazes me of all the things I have got to do and have learned when I look back at these past 3 months. I wish that I could go more into detail to all of the things that I have seen and learned to here at Xarma as Sammic’s Basque Stage, but this post would be very long and rather tiring to read! 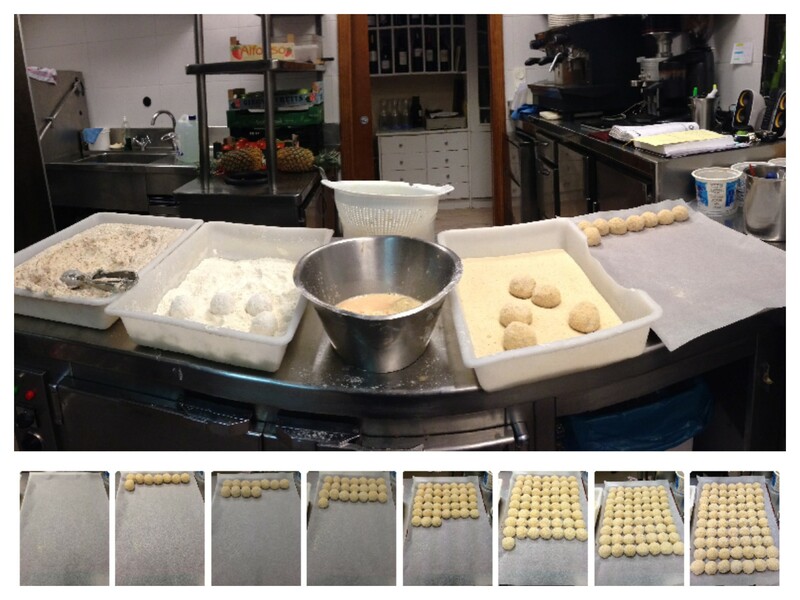 So instead, I will post a bunch of pictures of my time here in the kitchen of Xarma Jatetxea. One of my first impressions of Xarma when I walked into their kitchen was, “Hot DAMN!”. Pardon my language, but I was actually really astonished at how great of a kitchen they are blessed with. With only having a 35 seat restaurant, it was really surprising to see the kitchen to that caliber. But after having worked at this restaurant for about 2 months and seeing the quality of food that comes out of the kitchen, I can see how Chef Xabi and Aizpea utilize their kitchen to its fullest potential. So this post is about all the crazy, cool, and new pieces of equipment that I have had to use and had to familiarize myself with! So they have all the typical kitchen equipment that you would find in any typical restaurant kitchen. You know, stuff that isn’t really post worthy since they are all tools that you would find in any kitchen. One kitchen tool that would fit under this category would be a can opener. Right? WRONG. I remember the first time I had to open a can at Xarma and I swear I have never felt like a huge idiot in my life. 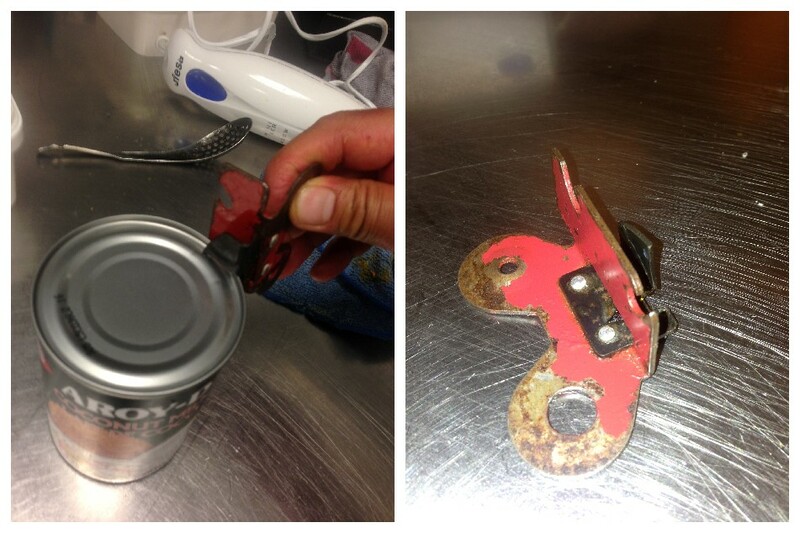 It took me about 10 minutes until I actually had to ask someone where to fine the can opener. They pointed me into the direction of the drawer that I had actually looked in a gazillion and then pulled out this small, red little thing that I had actually picked up in my own hand and looked at, wondering what in the world it could be. I’ve never been so embarrassed asking looking for something that I feel like I’ve used a million times! This is probably the machine I hear the most out of any piece of equipment while in the kitchen. “PSSSSSSSSSSSSSSHHHHHHHHHHHHHHHH”! That is the sound of freshness being concealed! This great piece machinery made by Sammic, the company that sponsors the Basque Stage, is how we ensure freshness of our proteins, sauces, basically everything.During my visit at the Sammic headquarters, I had spotted the exact same model of vacuum packing machines that we use at Xarma and my tour guide, Asier, had told that the machine is one of the best out on the market. Their vacuum packing machines gets rid of 99% of the air, ensuring that whatever you are packaging stays fresh for a longer period of time. I don’t know how many times I have accidentally made a mess in this machine from overfilling bags. Sorry guys!! 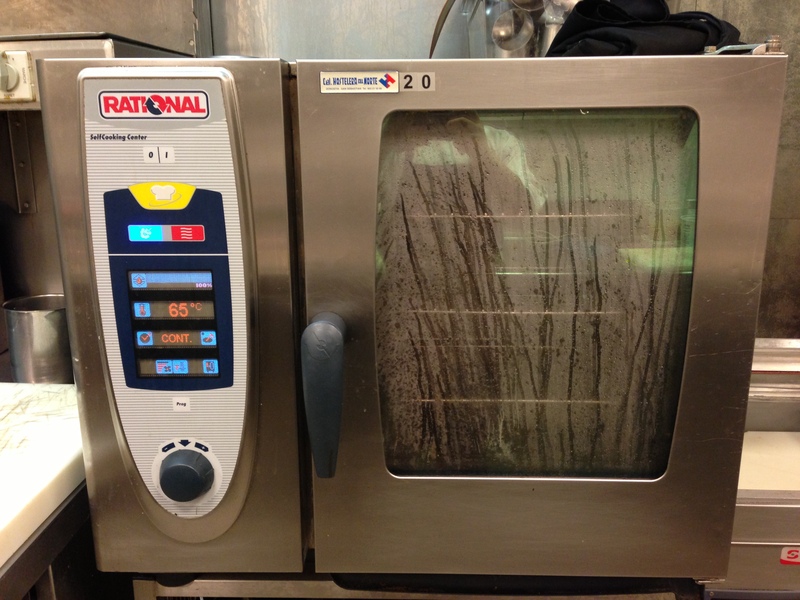 So when I saw the vacuum packaging machine, I was expecting to see a thermal immersion circulators, or better known as a sous-vide cooker. 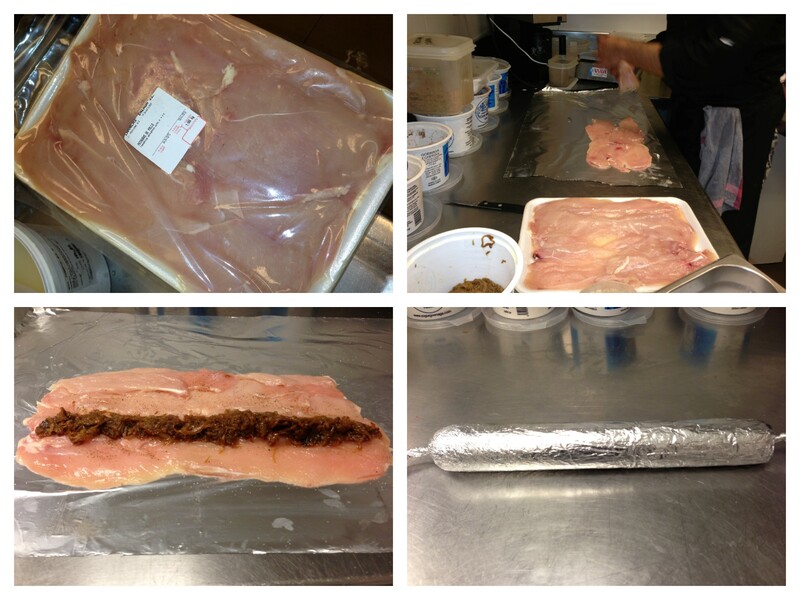 It only makes sense when a restaurant uses a vacuum packing machine so frequently. But I couldn’t see one insight. This all made sense when really took a look at their oven. I have only heard myths about the greatness of these special ovens called, “combi-ovens”. They basically do anything and everything you want. It is a convection oven, it also steams, it also combines the two, and it also is self-cleaning. I wouldn’t be surprised if you can download apps on it and play your favorite Pandora station off of it. But seriously, this thing is an amazing piece of machinery. It dials in into the most precise temperatures with any amount of humidity you want. At the same time you can choose what how much air you want cycling in your oven. This basically does everything a sous-vide machine does plus some! And whenever you feel like it’s getting a little dirty, just pop in a little soap disc, and turn on the clean cycle, and in two hours, you have an oven that looks like it has never been used. This machine is a BEAST. Next up, my new love. Sorry Vitamix, but I’ve been cheating on you. 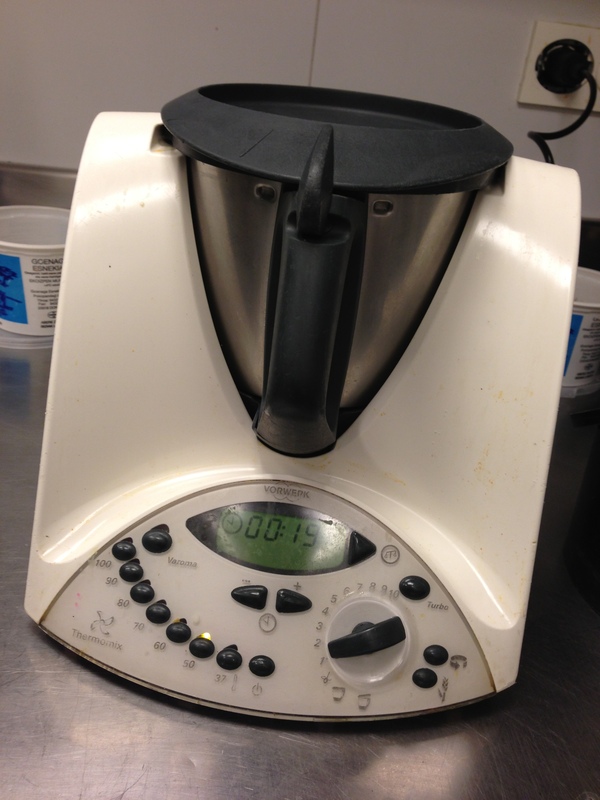 You have been so great to me, but there’s something better on this side of the ocean, and its name is thermomix. We use to have one at Txori that was brought over from Europe from one the original owners, but it was not in working condition, sadly. So this was my first time actually getting to use one and man, I never thought I could get so excited using a piece of equipment before! This thing does EVERYTHING. It has the power of a vitamix, but it also is a scale, a heating element, has a set timer on it, and I have even heard some crazy things that some models actually has a filter in it that basically strains as its pureeing the mixture inside! INSANE RIGHT?! Too bad they go for over 1,000 Euros, so I guess I must take advantage of this affair before going back to America where I am still happy settling with a Vitamix. This next one really caught me off guard the first time I saw it. I looked at it and thought to myself, “hmmmm, well that’s interesting……” I really couldn’t put together the pieces to this one and still have a hard time wondering why it made in this specific way, but man is it awesome! This is the plancha (or flattop grill) at Xarma. IT HAS A MOAT! Why, you may ask? I DON’T KNOW. But IT HAS A MOAT! My guess is that the water has to do with something with temperature control and helps creates a consistent range of heat throughout the plancha. I have done some research and found that this style of plancha is a ‘French Plancha’. While using it, I have not experience any form of sticking or burning or anything less than perfect when it comes to caramelizing or searing items. The great thing about this thing is that it’s also really clean and looks spotless whenever we give it a nice scrub. Let me talk about windows real quick. I am not talking about windows that you stare out of whenever you are daydreaming about being outside, but windows as in the specific period of time when something must take place. And here comes the paco jet. Here at Xarma, they like to make sure that all of their dishes come out with the highest quality possible. So that means that we spin ice creams to order for EVERY order. Now it seems like a pretty simple thing to do, but I found the hard way that it is quite difficult to get the timing just right. It requires the perfect timing to make sure that the ice cream is at the perfect texture at the time it needs to be plated. This means that we always have to be aware and be prepared for when a dish is about to come up in the tasting menus and also how each ice cream reacts after being spun. Some spin to the perfect consistency, while others need a little time back in the freezer to firm up a bit more. This has taught me to be really being on top of things when it comes to knowing where I am at with each ticket I am on. 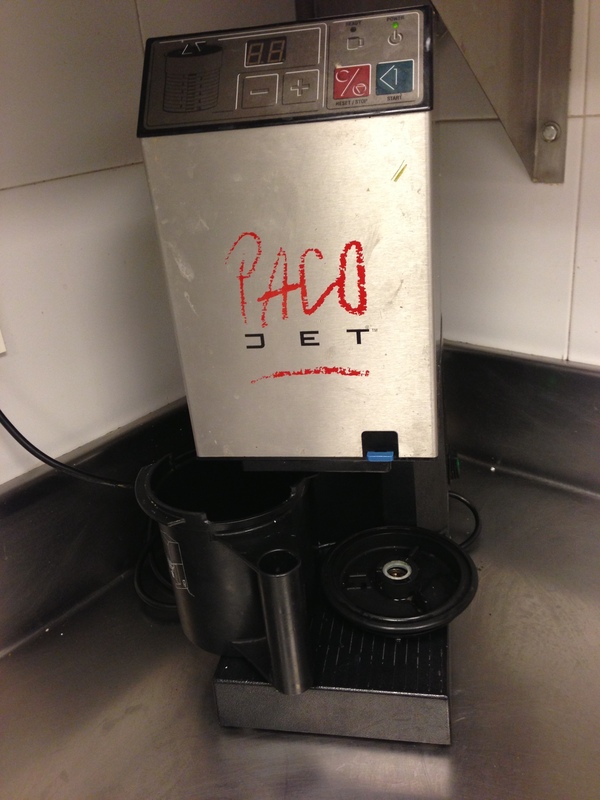 But other than that, I wish I had a paco jet in my house. 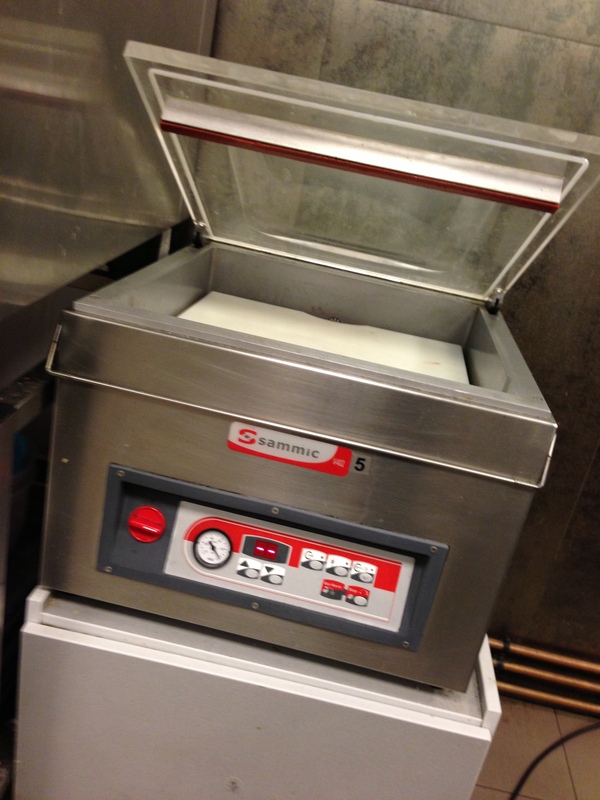 This thing is an incredible machine that makes for the creamiest textures of ice cream ever. Whenever I have an extra $4,000 laying around, I definitely know what I am purchasing! Aside from the tools we use at Xarma, there menu involves a good amount of molecular gastronomy and the chemicals which have been made famous by Ferran Adrià of elBulli fame. I was very excited to be able to see and understand how each of these chemicals work and have had a great time experimenting and using them to make some of the craziest stuff I have seen when it comes to food. 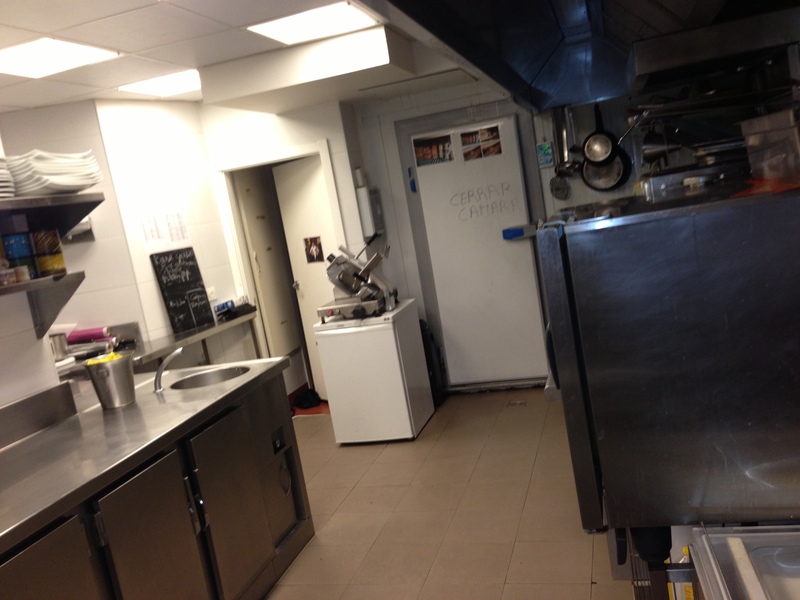 Working in a new kitchen is usually always nerve racking. 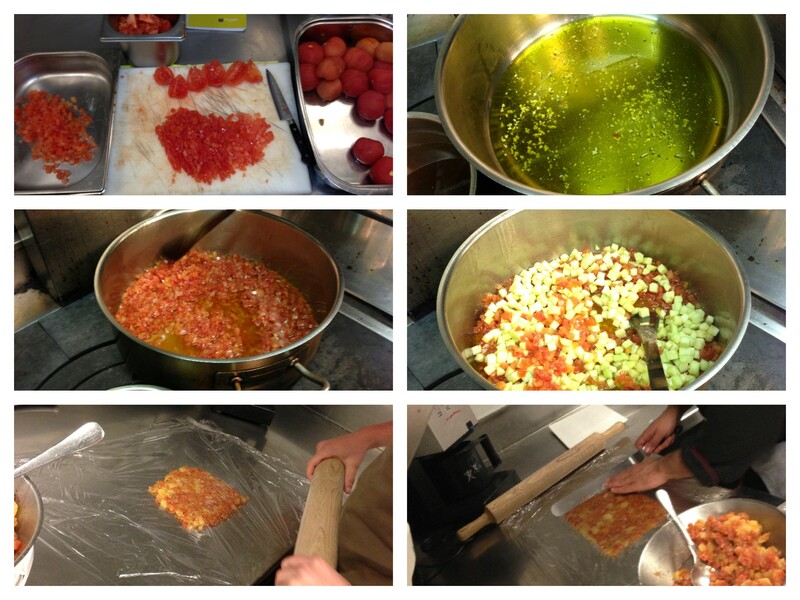 It takes some time to get use to where everything is and learn how things are suppose to run in the kitchen. Throw in a huge language barrier and a change in measurement and it makes it that much difficult for someone! But regardless of all the challenges that I have faced with being at Xarma, I have learned so much and have got to work in this amazing kitchen with some of the most talented chefs that are putting so much effort to really help me grow as a chef. I couldn’t be more grateful.